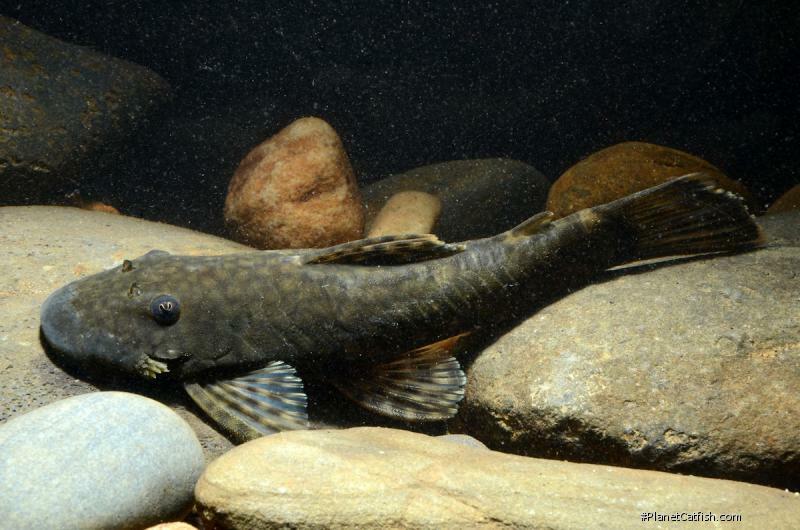 This Ancistrus is one of several, newly-collected, Loricariid catfish species from fast-moving Andean piedmont streams in the Madre de Dios region of Peru. L509 is shaped more like Chaetostoma than Ancistrus species most familiar to aquarists, presumably due to their specific adaptations to fast-flowing waters. They feature a very large, spoon-shaped head with a powerful sucker mouth to secure themselves to rocks. They are laterally-flattened to reduce their profile in the fast water. They also have large fins for powerful swimming strokes when movement is required in the strong current. L509 has a dark gray base color, with dense light gray spots. Their color is variable against different substrates but often they will show an overall blue cast to their coloration. L509 is remarkable because it may represent the first time that the growth and disappearance of snout tentacles associated with breeding cycles has been observed in captivity with any Ancistrus species. L509 are seasonal spawners, with breeding season corresponding to high water flow. In aquaria this is mimicked by replicating a "dry" season with warm water and fewer to no water changes followed by a "wet" season with cool water and frequent water changes. Temperature is fluctuated by the ambient climate - no heater is used in the spawning aquarium and the room temperature fluctuates between 64 and 76&def;F between winter and summer. No attempt has been made to alter other water parameters like pH or dissolved solids (7.5, 164ppm from the tap). Without manipulation of seasonal triggers the L509 have spawned only once per female per year for three years between late September and late November. Artificial manipulation of seasonal triggers may induce more frequent spawnings. If a replicated "dry" season includes limited feedings, the male's snout tentacles will disappear until the next breeding season approaches. Snout tentacles are small even in breeding season at about 1/8". As with most Ancistrus, L509 spawns in a closed, tubular cave where the female deposits eggs at the closed end and the male tends to the eggs and larvae until they are mature enough to start foraging. In this group's case, however, the largest female (7" TL) dwarfs the breeding male (4" TL) by almost twice, and therefore it's hard to imagine that the male is doing much wrestling with her to induce spawning. In fact, it appears that the female initiates spawning. Perhaps she grows impatient after developing eggs for the previous year. Since the collection sample is small (6 fishes) the comparative size between male and female L509 is unknown. If the males eventually outgrow the females, L509 could rival Ancistrus ranunculus in size! Multiple clutches of eggs have been observed with the same male (one clutch recently hatched, the other infertile and rotting), following the common pattern of Ancistrus for one breeder male to dominate breeding activity with multiple females within the group. Damage to a non-breeding male's fins has been observed, suggesting some degree of combat to establish breeding priority. Eggs incubate for 4-5 days, and larvae become free-swimming 4-5 days after hatching. The larvae are not particularly aggressive feeders and need a high density of food available for early development. Larvae grow successfully on the same foods as are offered the adults. Juveniles grow approximately 1.5" TL per year. The second generation has not yet spawned so sexual maturity by age or size is still unknown. L509 is easy to keep in a medium-sized aquarium of 30 gallons or more. They are fed prepared foods, especially sinking wafers/tablets and crumbled flake food for the larvae. Vegetables like cucumber, zucchini and collards are largely ignored by this fish. Well-oxygenated, fast moving water is important, especially in the simulated "wet" season, to replicate the natural habitat of the fish. Few other sympatric fishes are found in the wild with L509. Possible tank mates in captivity could include mid-water fishes from sub-tropical climates. No heater is required as long as extremes are avoided. Other aquarists keeping juvenile L509 have reported that extended periods near or over 80 degrees have resulted in the fish perishing. Outside of breeding season, L509 do not occupy caves, and prefer to hide between rounded stones or driftwood. Blumhagen, A & Blumhagen, J (2018). Search for the Missing Barbels: A New Mountain River Loricariid. Amazonas, Volume 7, Number 4. Pages 70-76. Evers, H-G (2018). Antennenwelse aus den Anden (Bristlenose Catfishes of the Andes). Datz, 8/2018. Pages 44-49.